Silers Bald was honestly a bit of a let-down. I was expecting a worthwhile view at the end, but there isn't. There are great views along the way though. 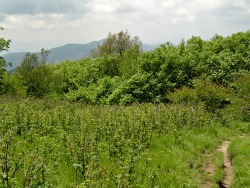 This is a 9.3 mile round-trip hike if you go all the way to Silers Bald. The views at the bald are minimal, so don't worry if you don't make it to the end. The views are better along the way. If you hike all the way you'll come across three grassy meadows. When you start out the hike, you have two choices. You can take either Clingmans Dome or Forney Ridge Trail. I recommend Clingmans Dome. It's easier. How to get to the trail: From Newfound Gap Road, take Clingmans Dome Road and drive all the way to the end where you'll find a parking area. 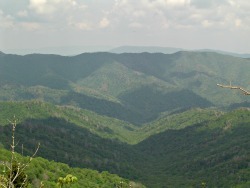 Hike the paved trail toward Clingmans Dome tower and cut over to the Appalachian Trail.